India is an amazing country for a variety of reasons. Not least among them, vegetarianism has been practiced there for thousands of years and is completely normal. The typical restaurant in India is vegetarian and even the non-vegetarian restaurants have extensive vegetarian selections. Many proudly advertise "Pure Vegetarian", which in India means no meat, fish, and eggs, and usually no alcohol or smoking either. Indeed, most of the people I spoke with were vegetarian. Veganism, however, is virtually unheard of and dairy products, in the form of milk, yogurt, cheese, and ghee (clarified butter) are ubiquitous. Haridwar and Rishikesh, five and six hours north of Delhi, are considered holy cities along the fast-moving Ganga (Ganges River). Haridwar (sometimes spelled Hardwar) means Gateway of the Gods, while Rishikesh means Lord of the Senses. Being holy to Hindus, both Haridwar and Rishikesh, by law, are pure vegetarian cities! It never stopped delighting me that all the ashrams, restaurants, cafes, bakeries, markets, food stalls, pushcarts, hotels, and cooking classes are completely vegetarian in these two cities. And the food was delicious - from northern curries to southern dosas, there was much to delight the taste buds and comfort the spirit. Haridwar is a very walkable city, where one can amble around town, stroll along the ghats (steps along the river), and go shopping through the narrow alleys. When you're ready to ride, however, it's easy to catch a three-wheeled vehicle, whether pedal-powered (cycle-rickshaw) or with an engine (auto-rickshaw). You could also take the gondola (rope way) up to the Mansa Devi Temple with great views over the city. There are also many other temples to visit in holy Haridwar. On the main road in Haridwar, not far from the railway station, is Big Ben, one of the very few air-conditioned restaurants in that city. All the Indian food I sampled there was delicious (something I unfortunately can't say for the Chinese food), and the navratan korma (9-gem curry) was especially scrumptious. Right across the street is Sindh Ganga Fresh Fruit Centre, a little juice shop where the proprietor understands that westerners don't want water or ice in the refreshing juices. If you want some fantastic south Indian fare, go around the corner on Jassa Ram to Kerala Restaurant. The chef-owner of this little place not only makes great food, but he is quite a funny character. 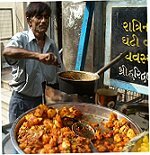 Just across from him, there are a couple of food stalls with other southern specialities as well as masala chai (Indian spiced tea). Rishikesh is a city on both sides of the Ganga with two nominally pedestrian-only bridges (beware the honking motorbikes and the mischievous monkeys!). Besides being another pilgrimage city, Rishikesh is also called the yoga capital of the world (I stayed at the lovely Anand Prakash Yoga Ashram), is a great place for rafting (be sure to go with an experienced guide), and was made famous in the West after The Beatles stayed at the Maharishi Ashram in 1968, writing most of the songs for the White Album there. One can still visit the ruins of the fascinating Maharishi Ashram, abandoned for several years now and being taken over by the forest. As a bigger tourist destination, Rishikesh has a wider variety of restaurants than Haridwar. Enjoy some food at one of the various Ayurvedic restaurants, try some Tibetan momos (dumplings) and thukpa (noodle soup with vegetables) at the Buddha Café, even wood-fired pizza at a couple Italian restaurants, in addition to many north and south Indian places. The German Bakery, overlooking Laxman Jhula and the Ganga, is a great place for western snacks, to meet other foreigners, and to relax and watch people and monkeys on the bridge. One of the things I loved about India is how animals (especially cows, but also goats, sheep, pigs, monkeys, dogs, chickens, and the occasional water buffalo, elephant, ox, horse, and camel) are integrated into daily life. It was an especially wonderful feeling in holy Haridwar and righteous Rishikesh to know that no animals were being raised for meat. Being in these vegetarian cities gave me a taste of how things could be! Haridwar will host the next Ardh Kumbha Mela, a huge Hindu festival, in March-April 2010. Rishikesh will hold its next annual International Yoga Festival in March 2010. Dan Brook, Ph.D., is a writer, speaker, activist, and instructor of sociology and political science. He also maintains Eco-Eating at www.brook.com/veg, The Vegetarian Mitzvah at www.brook.com/jveg, and No Smoking? at www.brook.com/smoke. Dan welcomes questions, comments, contributions, and other communication via brook@brook.com.